Be the first to share your favorite memory, photo or story of Margaret "Louise". This memorial page is dedicated for family, friends and future generations to celebrate the life of their loved one. At age 94, Margaret Wilson left this world on January 25 2019. She was the daughter of Robert Lee and Maggie Haston, beloved wife of Charles A Wilson, and sister to Joseph Haston, RL Haston and JM Haston, all of whom predeceased her and resided in Tennessee. Margaret is survived by her daughter, Brenda Wilson of Charlottesville, and her adored grandson, Wilson Ruotolo of Palo Alto, California. She is also survived by her cousin Emma Boyd, a sister-in-law Lillian Campbell, many nieces and nephews, and her former son-in-law, Augustino Ruotolo. Margaret grew up in Cumminsville, TN, completed High School there, and attended secretarial school in Nashville for a year until she was recruited to work for the Manhattan Project in the Secret City of Oak Ridge, TN in 1944. She was a secretary to leading nuclear physicists and engineers, and typed and proofread pages and pages of symbolic equations on her manual Royal typewriter. She also managed an office of support staff handling the work of 30 scientists at a time, most of whom knew the look in her eyes when they tried to cut corners in their work. Margaret worked full time “at the plants” in these roles for 38 years, feeling productive and valued while also raising a family and being a devoted wife. She met her husband to be, Charles, on a blind date in 1951. They married in 1952. They raised and loved their only child in the town to which they were both devoted. 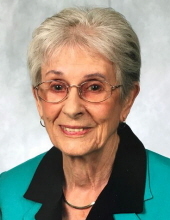 She was a long standing member of Kern United Methodist Church where she enjoyed participating in the church dinners. She and her husband enjoyed traveling by car around the United States in retirement. In her later years she moved to Charlottesville, VA to be closer to her daughter and grandson, and was known as a feisty, independent woman to the end. The family would like to thank Ms. Kitty Dickerson for her love and caregiving; the staff of Martha Jefferson House; and the staff of Medi-Home Health and Hospice. All were amazingly supportive, kind and attentive. The family would also like to acknowledge and thank Brenda’s many friends in Charlottesville and Oak Ridge and cousins in TN for their ongoing love and support to her as an only child in caregiving. Donations can be made to the Alzheimer’s Association, Martha Jefferson House Employee Fund in Charlottesville, VA or Kern United Methodist Church in Oak Ridge, TN. Funeral Services will be held at Kern Memorial United Methodist Church in Oak Ridge, TN at 11:00 am on Saturday, February 2, 2019 followed by refreshments in the fellowship hall and burial at Oak Ridge Memorial at 1pm. Weatherford Mortuary is handling the arrangements. An online guestbook can be signed at www.weatherfordmortuary.com. To send flowers or a remembrance gift to the family of Margaret "Louise" Haston Wilson, please visit our Tribute Store. Meet at Oak Ridge Memorial Park in the Garden of Valor. "Email Address" would like to share the life celebration of Margaret "Louise" Haston Wilson. Click on the "link" to go to share a favorite memory or leave a condolence message for the family.